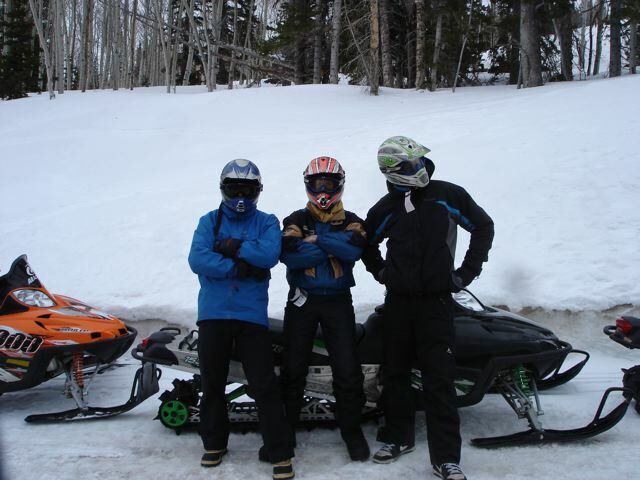 The most memorable day of a quick trip to Park City, Utah to ski with my son and his friend was when we went snowmobiling for five hours with Ricky Haynie, who owns All Access Recreation . Hadn’t planned it. Never done it. But Ricky was a friend of a friend who’d been recommended to help me find a room and a car. It was his idea. He is in business to “make family memories,” and he insisted that we try it. On my way home, a passenger next to me on the plane described his only snowmobiling experience in Yellowstone Park. It was exactly what I thought I would be doing in Utah—enjoying the views while riding along flat or gently rolling snow-covered, groomed roads and trails. I’d seen a video before I went that showed a rider with one knee on the seat, while standing on the other leg on the side. I was determined to tell the boys that they weren’t allowed to do anything that risky. I also didn’t tell my wife what was planned, so that she wouldn’t worry about possible injury. What our group did was the farthest thing from that safe and conservative ride I’d anticipated. Ours was pretty extreme. 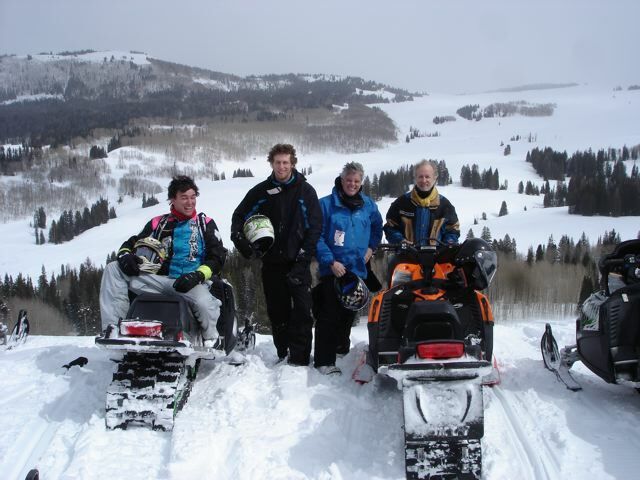 We went where there were usually no groomed trails, although we often followed early riders’ tracks. Within an hour I was taking jumps and getting three-feet of air. We climbed straight up hills that were 150 to 350 feet high, paused at the top and then came straight down at grades that Ricky said might be 65 to 85 degrees…where 90 is a completely vertical drop. I was often scared, wondering what the hell I was doing there, and recognizing that I was nuts. I wanted to quit sooner than the boys (ages 22 and 24) and a friend of mine who is a 55-year old lifetime jock. When they were supposedly hitting speeds of 60 or 80 mph, I was always last, poking along at a mere 40 to 50. I got stuck a lot…but so did all the others. I fell off the sled a lot, but so did the others. And I survived the whole challenge. I am really very proud of myself. I did it. I overcame lots of fear. I was simply in a zone of innocence and numbness. I even surprised Ricky when I attempted one hill climb and didn’t goose the gas enough, so I stopped going forward about 50 feet from the top…and started traveling backward. He was sure I was scared almost to death—I told him later I wasn’t the slightest bit afraid…too dumb to know better—and then I maneuvered the snowmobile perfectly and went backwards down this pretty steep hill right to the bottom. Then took on the hill a second time and made it over the top. Riders usually fall over going downhill backwards and need to be dug out and turned around. Ricky had never seen a rookie—or many experienced riders—do what I accomplished. A lot of the challenge is balancing the sled, so that it won’t tip over. You HAVE to lean when you are on the side of a hill. You do this by shifting your weight up hill while you’re seated, if that’s enough of a shift. You might also have to pick up one leg, putting a knee on the seat. Sometimes I was able to put both legs on one side of the seat. Ricky could put both legs on one side and lean so far over that the sled was balanced on just ONE of the two front skis! Of course the boys tried this a few times in flat pastures. Then there’s all the jumping. What a thrill. When you are zooming up a hill and reach the top, you keep gunning it to make sure you clear the highest point. And when you land, you better be aimed right. Land on one ski and you’ll tip and get thrown. Or the sled could fall on you and possibly bruise you or break a bone. 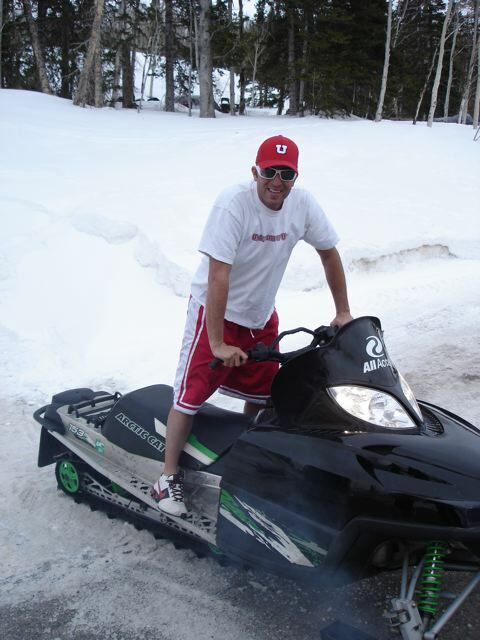 Fortunately there were feet of light snow, so that when my ankle was pinned one time, the sled just pushed it deeper into the snow. If it had been ice, with no give, I’d be hobbling on crutches about now. The scariest part of the day for me was within the first hour, watching Ricky climb a hill, then make a sharp right turn at the top. I was having trouble turning sharply, so when I reached the crest of the rise, I just kept going straight. But only then, when I was on the top, did I see that there was hardly any room to go straight. This hilltop was only about 10-15 yards wide. There was a major drop off right away, and if I didn’t turn sharply, I would be falling down 50 or 200 feet and run right into the trees. I freaked, cut the gas, hit the brake, turned as best I could. All in a fraction of a second. That was a close one for me, and it made me very cautious for the rest of the day. But there were plenty of times when someone went over the tops of other hills, couldn’t prevent the sled from turning and would crash the sled on its side. We’d get thrown up to 10 or 15 feet. And we loved it. All part of the adventure, to be covered in snow, laughed at, and to go back for more. This is not a sport for wimps. I was glad I tried it, survived it, and came back in one piece. I will tell you more about what I learned and what happened in future posts. Here is a sport that really looks difficult, but also like lots of fun. You can try it at just a foot off of the ground, but it’s more exciting to watch someone do it much higher. Now the other question you might have is how do you attach the highline to its two ends? Slacklining is a balance sport that uses nylon webbing tensioned between two anchor points. Slacklining is distinct from tightrope walking in that the line is not held rigidly taut (although it is still under some tension); it is instead dynamic, stretching and bouncing like a long and narrow trampoline. The line’s tension can be adjusted to suit the user and different types of dynamic webbing can be used to achieve a variety of feats. The line itself is flat, due to the nature of webbing, thus keeping the slacker’s footing from rolling as would be the case with an ordinary rope. The dynamic nature of the line allows for impressive tricks and stunts. Highlining is slacklining at large distances above the ground or water. This second video gives some insight into how the crew sets up a slackline and does the filming. This took place at the longest highline in Europe (103 meters = 338 feet) and the height is 50 meters = 164 feet. You can see more of these videos and others showing rock climbing at this site .